This intriguing savoury crumble could be adapted to a range of different flavours, and is a flavoursome recipe in its own right, but could do with “something more” in the main tomato layer. We left the crumble chunky to add texture. No, it isn't mince! This consists of two distinct layers – the tomato based celeriac layer, and of course the crumble. The tomato sauce itself is made from pasata and like all good home made sauces, really adds an intensity to the flavour lacking in shop bought tomato sauces. Saying that, the main ingredients were simply leeks and celeriac, which are not too thrilling and lack the “meaty” texture needed for stews (and this layer is really a stew). Any old veg and sauce would do the job just fine; just cook it up like you would a spaghetti bolognaise. The topping is far more interesting. It consists of wholemeal flour, rolled outs and ground almonds in equal quantity (50g) with half as much butter again (so 75g). This is flavoured by fresh thyme (we used lemon thyme) but I imagine many herbs would come out well. 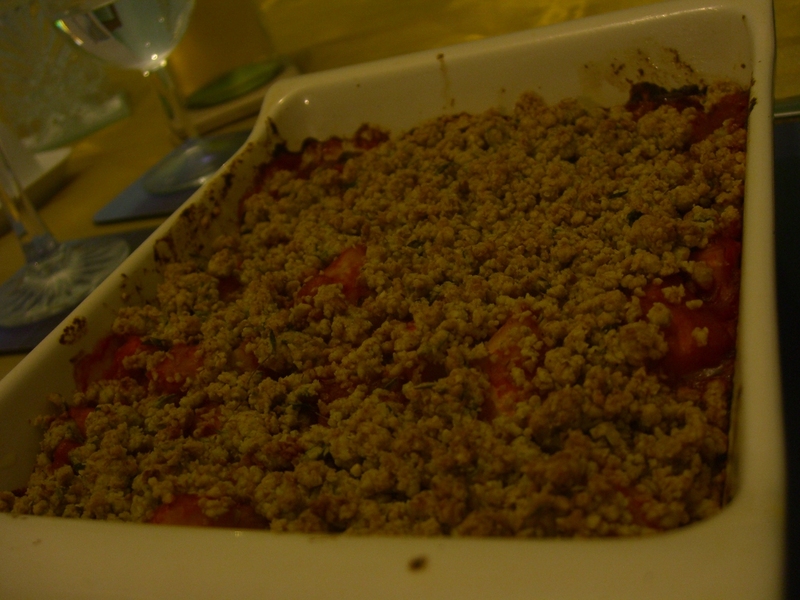 The crumble is baked for 30 minutes at 190 degrees. We had our celeriac “aldente” – just a little crunchy in places – which adds texture and preserves taste but was a little disconcerting. I’d prefer root veg properly boiled and to get my texture from something else, perhaps sausage or nuts. Still, we’ll definitely be trying the crumble idea again because it adds a unique texture and flavour to otherwise simple stew dishes. Recipe: “the complete vegetarian cookbook” by Sarah Brown, page 271.